More programs, more alumni, and more resources for research. IESE finished the 2015-2016 academic year on a bullish note, posting strong growth in all its areas of business and in its investment in infrastructure and technology. The school closed the 2015-2016 academic year with income of 102.4 million euros, up 6% over the previous year. The increase came mainly from its expanding MBA programs, which brought in 41.5 million euros (a 15% increase over the previous year), and executive education programs, which accounted for 51.8 million euros (up 11%) of income. Of particular note was a surge in financing for new research projects: funds for research jumped 75% over the previous year, reaching 4.1 million euros. This figure reflects the IESE facultys impressive research accomplishments, with 81 articles, 57 technical notes and 103 cases produced throughout the year, and with new initiatives such as the Private-Public-Partnerships (PPP) for Citiesinternational conference. These are just some of the figures contained in the 2015-2016 Annual Report, which highlights the academic activities programs as well as research that took place at IESE during the previous academic year, as well as other major developments around the school. The chapter on spending and investment highlights that during the 2015-2016 academic year IESE embarked on an ambitious plan to expand and modernize its infrastructure and campuses. The project includes expanding the Barcelona campus, which will see an increase in space of 3,400 m2 through an investment of 10 million euros over three years (2015-2018), and constructing a new building on the Madrid campus. Additionally, IESE earmarked 3.5 million euros to finance its scholarship program, especially designed to attract top-quality candidates to its programs, another of the schools main priorities. The introduction of a fifth MBA section in response to growing demand. Prof. Franz Heukamps appointment as the new dean of IESE, taking over from Prof. Jordi Canals after 15 years in the post. The expansion of custom programs, with a notable presence in Asia thanks to clients such as Michelin, Lixil, Banco Santander and Oracle. Innovations in programs for executives and the introduction of new online courses such as Foundations of Management, offered through the Coursera platform; and others such as the WeGrow program to mentor start-ups, another tool IESE makes available to entrepreneurs to support the creation, growth, and consolidation of new business initiatives. Two new chairs: the Puig Chair of Global Leadership Development and the Fuel Freedom Chair for Energy and Social Development. 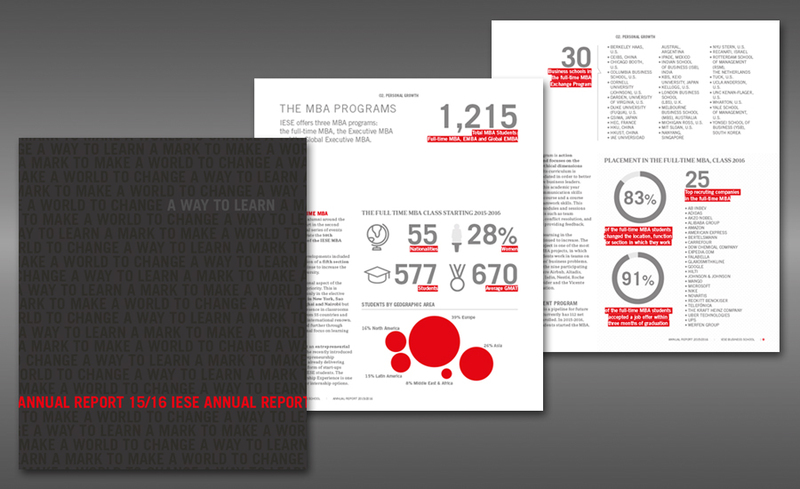 IESE’s 2015-2016 Annual Report testifies to the efforts the school is making to continue advancing in its strategic priorities: the internationalization of its activities; the digitization and modernization of its resources and installations; the constant adaptation of its academic offerings to the challenges of non-stop and globalized learning; and, above all, to IESE’s vocation to contribute to the development of people and society.